Grinding machine is a type of machine tool and it is similar to other machine tools such as milling machine, turning machine, Lathe Machine and many more. The major difference between Grinding machine and other conventional machine tools is the type of operation and method of machining. Generally, all the machining process removes material from the work piece in the form of chips and manufacture the desired product. Now the question is how Grinding machine differs from other machining processes and how the material removing process is done. All the detail regarding the mechanism of material removal, machining process and types of Grinding machine is discussed below. Grinding machine operates at high speed similarly other machine tools but the difference in the operation. The grinding machine used for finishing only after the machining done by some other machine tools. We can say that the function of the grinding machine comes into play after the machining of a work piece by turning or milling machines. The grinding machine provides high accuracy and fine surface finish with minimum tolerances. The machining process is done by the abrasive action of the grinding wheel; the abrasives are embedded over the periphery of the rotating wheel. In Grinding machine grinding wheel is work as a cutting tool and responsible for all machining processes. In the grinding process, a layer of abrasive is responsible for removing the material from the work piece. As machining starts, the abrasives of grinding wheel and work piece comes into contact and due to the rubbing force the initial layer from the grinding wheel is worn out and a fresh layer of the abrasives involve in machining this process is continuously repeated until complete machining is done. The process of wear out of the old layer and coming of the fresh layer is known as self-sharpening behaviour of the grinding wheel. The self-sharpening behaviour of grinding wheel is a necessary part of the grinding machine and the selection of the grinding wheel depends on the work material. The bond between the abrasives is not too strong if the bonds retain the abrasives strongly then it will not allow the abrasive to be pulled out after wear. Therefore the worn out abrasives will rub over the work piece without machining or removing further material. This is known as Glazing or Blunt wheel Grinding. When Glazing occurs then a single point tipped tool will be used to remove the worn out abrasives from the grinding wheel. This process provides a new and fresh layer of abrasives for removal of material. This process is known as Dressing of grinding wheel and the whole process takes 15 to 20 minutes to operate. The life of the grinding wheel is described as the time period between two successive dressings. Size effect: As above discussed the machining is done by the abrasive action of grinding wheel that’s why a large portion of the abrasive will be embedded inside the wheel and a small portion of abrasive will be allowed to interact with them , therefore, less material is removed. This is known as size effect and this reason is most responsible as compare to other two. Negative Rake Angle: The abrasive particles on the grinding wheel are randomly oriented without any proper position but generally abrasive particles interact with the work piece with Negative Rake Angle. As we know that negative rake angle increases the strength and requires high cutting forces so it is beneficial for the grinding wheel to avoiding the easy pull from the wheel. Welding effect: We all familiar with the welding almost same thing happen here i.e. the temperature at the interface between the wheel and the work is very high due to which material once removed undergoes a welding effect which has to remove in the second pass. 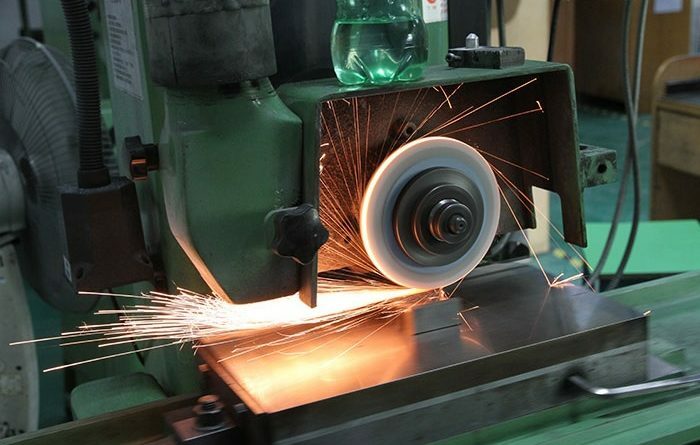 Grinding wheel is the main component of the grinding machine. It is responsible for the whole machining process. 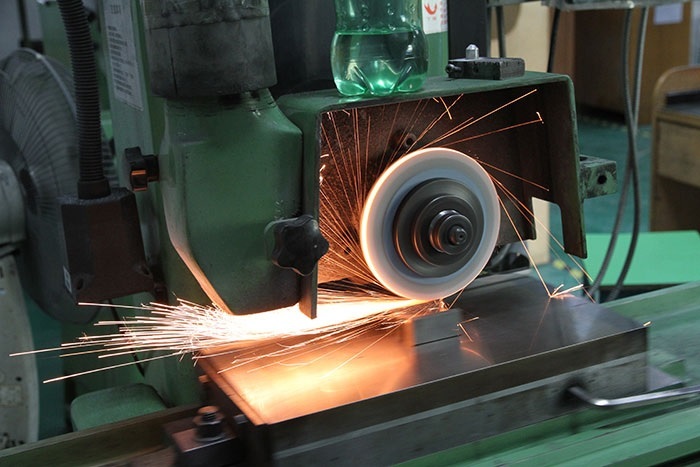 The proper selection of grinding wheel is very important and the selection of the grinding wheel depends on various factors such as a material of the work piece, finishing requirements etc. The life of the grinding wheel depends on its specifications. With the use of following formula, you can easily understand and remember the specification of any type of grinding wheel specification in proper sequence. The selection of abrasives for the grinding wheels are depends on the material type of the work piece. On grinding wheel specifications abrasives is represented by an alphabetic character. If we consider three basic types of work materials i.e. very hard, hard and soft or medium then for each category different types of abrasives are used. The machining of very hard materials is done by using Cubic Boron Nitride (CBN) abrasives. CBN is as hardest as diamond so it is used in place of the diamond because we cannot use diamond as an abrasive because diamond will diffuse the carbon atoms into the work piece due to this the machineability of the work piece will decrease. For the hard material work piece silicon carbide (SiC) and Boron Carbide (B4C) are used. Boron carbide is less efficient as compared to the silicon carbide so most of the time hard materials are machined by using silicon carbide abrasives. The last category of material is soft and medium hardness materials which are machined by using Aluminum oxide abrasives. The steel is machined by using Aluminum oxide over the silicon carbide because Aluminum oxide is tougher than the silicon carbide so it is preferably used to machine steel having higher tensile strength. Moreover Aluminum oxide has higher chemical inertness which improves the wear resistance. Grain size defines the size of the abrasive particles and on grinding wheel specifications it is represented by numerical characters which are shown in table. The grain size plays important role in the machining process i.e. for a rough grinding course or medium grain size required whereas for the fine grinding fine or very fine grain size is required. Grain size is inversely proportioned to the Grain size number. The relation between the grain size and grain size number is easily understood by using the following table. With the help of the above data, you can easily predict the grain size by checking the grain size number. Grade defines the hardness and the ability of the bond to retain its abrasives on any grinding wheel. On grinding wheel specification it is shown by an alphabetic character. We can easily predict the hardness of the grinding wheel just by seeing the alphabetic characters. A to H represents the soft grinding wheel. I to P represent the Medium hardness of grinding wheel. Q to Z represents the hard wheel. While selecting the grinding wheel the grade of the wheel very important because different materials required a different grade of the wheel. The machining of soft materials is done by only hard wheels whereas hard work pieces are machined by only soft wheels and the medium hardness work pieces require medium hard wheels. If we do not use the accurate combination then our machining will be affected. In high-high combination the work piece and the grinding wheel both have same strength so the rubbing forces will be high therefore the abrasives wear out quickly because the wheel is also hard and it will not allow the abrasives to pulled out therefore only a rubbing action will be observed and glazing takes place after each 4-5 minutes of machining. Glazing is followed by 15-20 minutes of ideal time which is not justified. So we cannot prefer it. The same case takes place when a soft-soft combination is used. In this case, the abrasives are pulled off without the effective utilization. This proves that both the cases are not preferable while machining. Structure is defined as the average gap between the two consecutive abrasive particles if the average gap is high then it is an open structure whereas if the average gap is less than the structure is known as a dense structure. A structure is represented by a numeric character on the specification of the grinding wheel. The structure is directly proportional to the structure number if the structure number lies in between the 0 to 7 then it known as a dense structure whereas if it is in between 8-16 then it is known as an open structure. The selection of the structure depends on the two characteristics these are the hardness of the work piece and the type of machining required. The open structure is used for the machining of soft material whereas dense structure is used for the hard work piece. The same criterion follows while the section of machining for rough machining open structure is required whereas for fine machining dense structure is required. The selection of the structure of the grinding wheel can be easily understood by the one simple example. The rough grinding on the soft and ductile material done by only open structure because the work piece is soft and ductile therefore the chip flow will be continuous and rough grinding involves more material removal and more space for the chip removal is required. In other cases if the structure is dense then the chips will be clogged around the abrasives and which will not allow the abrasive to interact with the work piece. This process is known as loading or clogging of the grinding wheel. Therefore to avoid loading open structure must be selected for the rough grinding of a soft and ductile work piece. There are various factors also responsible for the clogging such as if the speed of machining is low, the cutting fluid is not properly supplied and while machining of very soft materials like rubber. It is also known as ceramic bonds and has high strength, hard and brittle like glass. These bonds are made with the help of clay mix and fluxes and harden like glass after firing to a temperature of about 1250 to 1300 degree centigrade. That’s why these bonds have a very high temperature withstanding capacity. These bonds are unaffected by the use of any kind of cutting fluid. The main drawback of these bonds is they cannot use for high-speed application because at high speed the centrifugal forces will also high so the hard and brittle bonds may fail or break. These bonds are made up of sodium silicate which is like a water glass. These have less strength as compared to vitrified bonds and can be affected by dampness. These bonds are used in the low heat generation applications. As rubber is soft and flexible material so this bond is also soft and flexible. This bond is used on grinding machine with the flexible wheel known as buffing. It can be used for polishing of wheels in centreless grinding applications. This is all about grinding process. If you have any query regarding this article, ask by commenting. If you like this article, don’t forget to share it on social networks. Subscribe our website for more inforamative articles. Thanks for reading it.